The Glorantha Sourcebook is an important companion to the three roleplaying games set in Greg Stafford’s world of Glorantha—HeroQuest Glorantha, RuneQuest: Roleplaying in Glorantha, and 13th Age Glorantha—all three of which are, like The Glorantha Sourcebook, published by Chaosium, Inc.. It is a systemless sourcebook which introduces the mythic and mythological underpinnings of Glorantha, taking us from the creation of the universe and God Time to the Gods War that introduced Death to the world, the Compact that ended it and introduced Time to the world, and beyond... It is the story of gods and heroes, kings and prophets, and more, but it is not though, the definitive work on Glorantha as a whole. There is the massive eight-hundred page, two-book The Guide to Glorantha for that. Instead, The Glorantha Sourcebook focuses very much on the myths and pantheons of the peoples who will ultimately come to clash in one geographical area—that of Dragon Pass, the region which allows egress north to to south through the mountains which divide the northern continent of Genertla. All this telling will come to a head in the year 1625, at the beginning of the Hero Wars—the starting point for both RuneQuest: Roleplaying in Glorantha and 13th Age Glorantha. The volume begins with a short description of Glorantha’s geography, before diving into a history of Dragon Pass. This literally sets everything up for what follows in the book, being a annotated explanation of the feud between the House of Sartar and the Red Emperor, between the Lunar Empire and the peoples of Dragon Pass. It is written as a gift from a scholar to the queen in Nochet, the City of Queens, so much like the rest of The Gorantha Sourcebook, it is no dry, objective text, but subjective and opinionated. As well as giving the history, it gives the details and family trees of the dynasties that have shaped the region, notably the Feathered Horse Queens, the Lunar Kings of Tarsh, and the various Sartar Dynasties. Although their involvement in the events of Dragon Pass has waxed and waned over the centuries, the Elder Races are not ignored and are described in turn. Of these, the write-up of the Aldryami is somewhat brief in comparison of those given for the Dragonewts, Mostali, and of course, Uz. At the heart of the supplement though are two lengthy and opposing set of chapters, which together continue the explanation of the feud between the House of Sartar and the Red Emperor. Where this explanation has been historial, here it is very much concerned with the gods. The first set consists of ‘Theogony’ and ‘Time’. ‘Theogony’ presents the stories and creation myths of Glorantha’s gods, element by element, in turn Darkness, Water, Earth, Fire, and Air. Each is accompanied by a family tree that depicts the element and his or her descendants in their classic iconic forms as well as maps of their associated realms. Thus Darkness is accompanied by a map of the the Underworld, Water by a cross section of the oceans, Earth by a map of the realms of the Green Age, Fire by a map of the realms of the Golden Age, Air by a map of the Storm Age or Lesser Darkness, and so on. From the creation of the universe and the world, the chapter takes the reader through God Time and the events of the God’s War that ultimately would lead to the events of the second of these chapters, ‘Time’. What is notable about ‘Theogony’ is that is not written from the point of view of these pantheons’ contemporary worshippers in Dragon Pass, but from the God Learners of the Second Age. Although initiates of the cults dedicated to these deities might not necessarily agree with the interpretations of the God Learners, their attempts to rationalise myths actually serve to make them accessible for the reader. ‘Time’ actually presents the actual history of Dragon Pass from the end of God Time through the First, Second, and Third Ages up until the beginning of the Hero Wars. This is a relatively short chapter, but it is important because it what keeps the mortal world separate from God Time and it is the compact that created it that is so threatened by the contents of the opposing two chapters. The opposing set of chapters are ‘Gods of the Lunar Way’ and ‘The Redline History of the Lunar Empire’. Together these describe the deities, heroes, goddess, empress, and emperor who will fight on the opposing side in the Hero Wars. Of these, the goddess—the Red Goddess—is the most significant because she is a goddess reborn in Time, who lived as a mortal and became a goddess once again, thus threatening the compact that brought Time into the world and separated it from God Time. It is her son, the Red Emperor, who will be born again and again over the course of the history detailed in ‘The Redline History of the Lunar Empire’. It is the Red Emperor’s decision to expand the Glowline, the magical border of the Lunar Empire, into Dragon Pass and the differing nature of their religions—the Lunar Empire accepts Chaos as part of natural order of things, whereas the people of Sartar and its surrounds see Chaos as a threat, that will see the two cultures and peoples clash again again culminating in the Dragon Rise ceremony which triggers the Hero Wars. Beyond these lengthy chapters, The Glorantha Sourcebook essentially looks at the nature of the forces arrayed against each other in the run up to the Hero Wars and beyond. ‘Gloranthan Magic’ explains the Runes and their relationships, the latter nicely depicted and explained with a series of diagrams. This and the discussion of the types of magic will likely be amongst the most familiar content in the book. ‘Gods and Mortals’ notably details the leading heroes of the Hero Wars, including Harrek the Berserk, Jar-eel the Razoress, Delecti the Necromancer, and of course, Argrath Whitebull, who will lead the rebellion against the Lunar Empire. Lastly, the shortest chapter is ‘Startar Magical Union’, which introduces the Warlocks who combine a number of magical disciplines in serving Argrath Whitebull. The description of the Warlocks are quite brief, but their inclusion, like much of the supplement, sets the stage for the Hero Wars. Physically, The Glorantha Sourcebook is a highly attractive hardback. It is clearly written, with a strong sense of story, though in places the style is a little heavy going, but then that is sometimes the way of such mythologies. The book is liberally illustrated though, with great depictions of the gods, heroes, and myths discussed in the text. A lot of the artwork is not new though, but it is used effectively and more than serves the text to support the differing points of view presented throughout the book. In particular, the stone reliefs taken from Sartar’s Palace, which depict the history of Dragon Pass up to the Dragon Rise, are wonderfully evocative and echo those of the Assyrian Empire. The Kyger Litor temple friezes of the Uz are also good. The Glorantha Sourcebook is not quite perfect. There is an instance of incomplete text and perhaps it could have done with clearer maps of Dragon Pass and the surrounding area to help the reader gain an easier grasp of the flow of events of the region’s history. Certainly the maps of the growth and fluctuating fortunes of the Lunar Empire from Wane to Wane help with its history and it would have been nice to have seen something similar done for Dragon Pass. Another issue is that because much of the content is written from differing perspectives, it can sometimes be a little awkward to put the various stories, histories, and events in context with each other, so certainly for the period of Time, an actual timeline might have been a useful addition. In comparison, the write-up of the Lunar Empire is much easier to follow because of timeline. Drawing on diverse sources, such as Wyrm’s Footnotes, for both its text and illustration, there is certainly much here that Gloranthaphiles—devotees of Greg Stafford’s world—will find familiar in the pages of The Glorantha Sourcebook. To be truthful, the supplement is not quite aimed at them, although there is much in its pages that they will useful in terms of easy reference, especially given that its contents have been updated. Rather The Glorantha Sourcebook is intended as an introduction to specifically Dragon Pass and an exploration of the events leading up to the Hero Wars, framing the conflict not so much as between dynasties, but as between myth and magic. 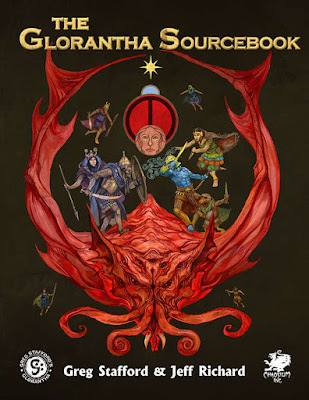 What this means is that The Glorantha Sourcebook is an excellent companion volume to The Guide to Glorantha, but an even better companion to both RuneQuest: Roleplaying in Glorantha and 13th Age Glorantha, serving to introduce, support, and frame the conflicts that those two roleplaying games open with.